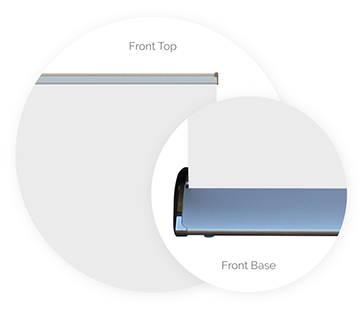 The Silverwing Double Sided Banner Stand is a 33" wide banner display system that captures the attention of views from the front or rear! Suitable for display in the middle of a room or hallway, the Silverwing's unique double-sided approach to messaging delivers your important message on both sides, doubling your potential sales opportunities. The printed vinyl banners unroll from within the attractive, substantial base and are anchored to the expandable support legs via an easy tongue and groove connection bracket. Your 81" tall images are pre-installed by Printastic when purchasing the Silverwing Banner Stand and no additional tools or materials are required at the time of setup. The Silverwing is delivered in a rugged travel case that features a business card window for easy identification in baggage claim areas. 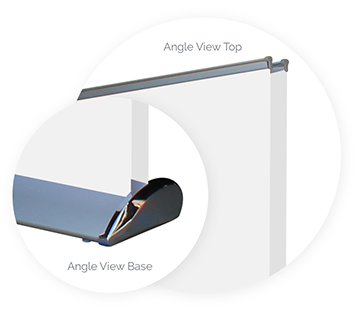 In addition, reinforced corners ensure that your Silverwing Banner Stand arrives at its destination in good shape. The Silverwing Banner Stand from Printastic is a "right sized" solution for delivering impactful double sided messages on vinyl banners. Velcro Brand Hook & Loop Fasteners provide easy graphic exchanges and the telescoping support leg keeps images taut and crisp.